The US Composite PMI has now unwound what was left of hysteria – the often purposefully over-hyping of generally unconvincing improvement. It may be this is where the tax cuts went because they sure didn’t end up in US consumer spending. Either way, the composite leaked again lower in December to the worst since before hurricane Harvey. 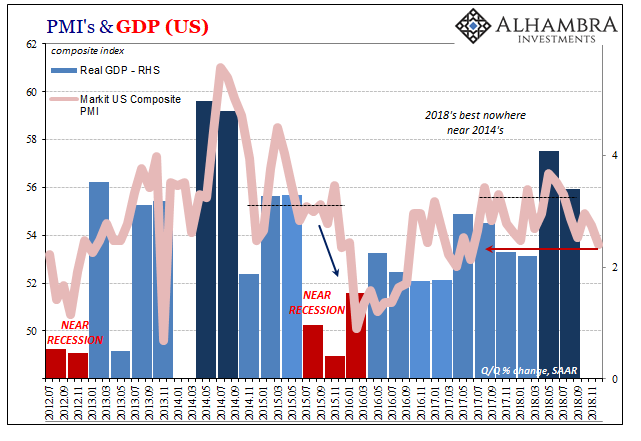 The US economy isn’t going it’s own way, it is already faced in the same direction as everyone else if only a few steps behind. That’s all decoupling would turn out to be each time it was meekly offered prior. Ultimately, this is pretty much the only use for PMI’s; forget the 50 growth versus contraction dividing line. They can tell us when things have changed in a general sense if not usually in that specific fashion. 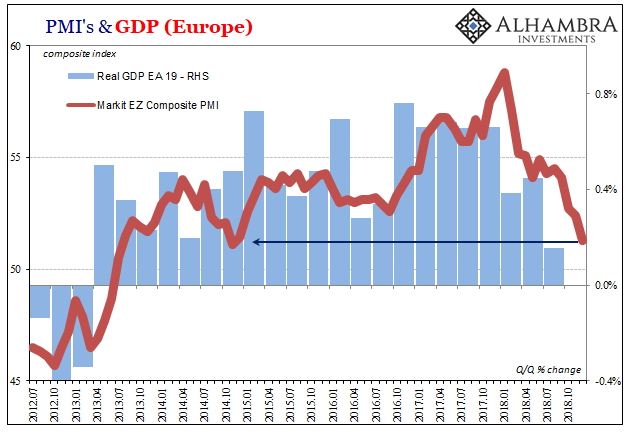 Europe’s composite PMI may very well never stray into the 40’s, yet real GDP could turn out negative anyway. Momentum hasn’t been lost in Europe or the US, it’s just become negative momentum. The eye-catching descent from last year is enough, which continued full-on in December. The kiss of death, this new Draghi balance.